Millions of people around New York City and points north can plan to watch a faint asteroid dramatically black out a bright naked-eye star very late next Wednesday night (the night of March 19–20). And if you’re anywhere from the Carolinas to Nova Scotia to Winnipeg, a citizen-science project is asking you to keep watch too! Get ready for the best and brightest “asteroid occultation” ever predicted for North America. Late on the night of March 19–20, the faint asteroid Erigone (eh-RIG-uh-nee) will briefly eclipse the bright naked-eye star Regulus for more than 20 million people in the New York metropolitan area and parts of Long Island, New Jersey, Connecticut, upstate New York, and Ontario. The star will vanish from sight for up to 14 seconds around 2:06 a.m. EDT on the morning of the 20th for New Yorkers, and a minute or two later farther north. 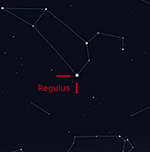 If the sky is clear, Regulus will be a cinch for anyone to spot — no astronomy experience required! Around 2 a.m. or a bit before, go out and face the Moon. Extend your arms straight out to your sides. Regulus will be straight above your right hand, roughly as high as the Moon is. It’s the brightest star in that area. When Venus passes in front of the Sun it hides a part of our star’s rotating surface. Because of rotation, the spectrum of the Sun (created splitting the different colours of light using a spectrograph) is slightly different on each side. On one side, the solar surface is rotating towards the observer and so its light will be ‘blueshifted’, meaning the lines seen in a spectrum move towards shorter wavelengths. On the other, the surface is rotating away from the observer, so its light is ‘redshifted’, meaning that the lines move towards longer wavelengths. By looking at the reflected light from the lunar surface, this is averaged out as a broadening of the various lines. When Venus moves in front of the Sun from east to west, it first blocks out the surface moving towards us and then the surface moving away from us. This causes a distortion in the spectral lines known as the “Rossiter-McLaughlin effect”. The astronomers realised that the High Accuracy Radial Velocity Planet Searcher (HARPS) spectrograph installed on a 3.6m telescope at La Silla in Chile, part of the European Southern Observatory (ESO), would be sensitive enough to detect the effect and that the Moon would be in the right place too. The Moon was slightly ahead of the Earth in its orbit, so ‘saw’ the transit a couple of hours later than terrestrial observers. This also meant that the Moon was in the night time sky in Chile, making it possible for the La Silla telescope to operate safely and observe the change in the solar spectrum. Located within 10 degrees of the North Pole, northern Ellesmere Island in the High Canadian Arctic offers continuous darkness in the winter months. The lack of a day/night cycle greatly enhances the detection efficiency of planetary transit surveys and other time domain astronomy programs. We deployed two wide-field cameras at 80 degrees N, near Eureka, Nunavut, for an observing campaign in February 2012. The camera systems were based on commercial f/1.2 lenses with 85mm and 50mm focal lengths, and they continuously imaged 504 and 1,295 square degrees respectively. Together, the cameras took over 44,000 images and produced precision light curves for approximately 70,000 stars. Exactly 243 years ago, Captain James Cook made the sketch you see above. On June 5–6, 2012, you could make your own drawing of such a rare celestial event (provided you have the right eye-protecting equipment). But don’t miss the chance, as you won’t get another one for 115 years. Cook’s drawing shows the Transit of Venus as it appeared on June 3, 1769, from Tahiti. During first voyage around the world, Cook, astronomer Charles Green, and the crew of the HMS Endeavour set up observing equipment on what is now known as Point Venus. In fact, the Transit was one of the motivations for the expedition, as it would provide valuable information for determining the size of our solar system. The explorers made many measurements of the event, and Green added his own sketch (see the downloadable large image). On June 5 2012, the Solar Dynamics Observatory (SDO) collected images of the rarest predictable solar event — the transit of Venus across the face of the sun. This event lasted approximately 6 hours and happens in pairs eight years apart, which are separated from each other by 105 or 121 years. The last transit was in 2004 and the next will not happen until 2117. ESA’s Venus Express and Proba-2 space missions, along with the international SOHO, Hinode, and Hubble spacecraft, are preparing to monitor Venus and the Sun during the transit of Earth’s sister planet during 5-6 June. ESA’s Venus Express is the only spacecraft orbiting Venus at the moment and while the transit is being watched from Earth, it too will use light from the Sun to study the planet’s atmosphere. As sunlight filters through the atmosphere it reveals the concentration of different gas molecules at different altitudes. Meanwhile, NASA/ESA’s Hubble Space Telescope will use the Moon as a giant mirror to capture diffuse, reflected sunlight: a small fraction of that light will have passed through the atmosphere of Venus en-route to the Moon. This will test techniques aimed at measuring the atmospheres of Earth-sized rocky exoplanets that could potentially reveal traces of life on planets outside our Solar System. High above Earth, astronaut Don Pettit is preparing to photograph the June 5th Transit of Venus from space itself. Because transits of Venus come in pairs that occur once every 100 years or so, humans have rarely had the chance to photograph the apparition from Earth, much less from Earth orbit. “The Expedition 31 crew will be the first people in history to see a Venus transit from space, and Pettit will be the first to photograph one,” says Mario Runco, Jr. of the Johnson Space Center (JSC). Runco, an astronaut himself who flew aboard three shuttle missions, is an expert in the optics of spacecraft windows. Along with his wife Susan Runco, who is the coordinator for astronaut photography at JSC, Mario is helping Pettit gather the best possible images of the transit.